Welcome to Thanksgiving Week 2011! As I mentioned on Friday, I’m going to be posting a different Thanksgiving recipe every day this week in preparation for Canadian Thanksgiving, which is next weekend! Each day I'll share a recipe for a different aspect of the meal, which will include a drink, appetizer, bread, side, salad, vegetarian main, and dessert. I won’t be sharing a turkey recipe because I’ve never made one myself, and I think that most people already have their own tried-and-true recipe and won’t be willing to gamble with a new one on such an important occasion! But hopefully the recipes I’m sharing will give you some inspiration for your Thanksgiving meal, or even just a regular meal for any day of the week! My twin sister Genevieve, from Vanilla & Spice, will be posting a vegan Thanksgiving recipe each day this week, so make sure you check out her blog every day too! Today she's starting out with an appetizer recipe for delicious little sweet potato bites, aren't they adorable? I decided to start the week with arguably the most important part of the meal – drinks! There are a lot of delicious sounding apple and pumpkin cocktail recipes that I’ve been dying to try lately, but for a big holiday gathering I think punch is more appropriate. Unless you have a dedicated bartender for the night, you probably don’t want to worry about mixing up individual drinks and topping up your guests’ glasses when you have so much other stuff going on in the kitchen. That’s why punch is perfect – just mix everything before everyone arrives, then you don’t have to worry about it for the rest of the night because guests can just serve themselves whenever they want. This recipe for apple orchard punch got great reviews on All Recipes, and also features two flavours that are perfect for fall (apple and cranberry), so I knew I had to try it. Not surprisingly, it was delicious! I made this for a family gathering and everyone really loved it. It’s also ridiculously easy – just throw a few things in a bowl, stir it around, and voila! I made ours with sparkling wine, but you could easily use ginger ale for a non-alcoholic version. Better yet, double the recipe and make two versions – one for the adults and one for the kids (just make sure you don’t get them mixed up!) I thought the apples on top gave it a nice visual presentation, but I noticed one reviewer said they froze fresh cranberries into ice cubes and added those, which I think is a great idea. You could also just throw some cranberries in the bowl on their own and that would be a nice addition too. Please ignore the ugly pictures of this – I didn’t have time to take any pictures in proper lighting. Just trust me that this looks and tastes a lot better than these pictures suggest, and I hope your family enjoys it as much as mine did! 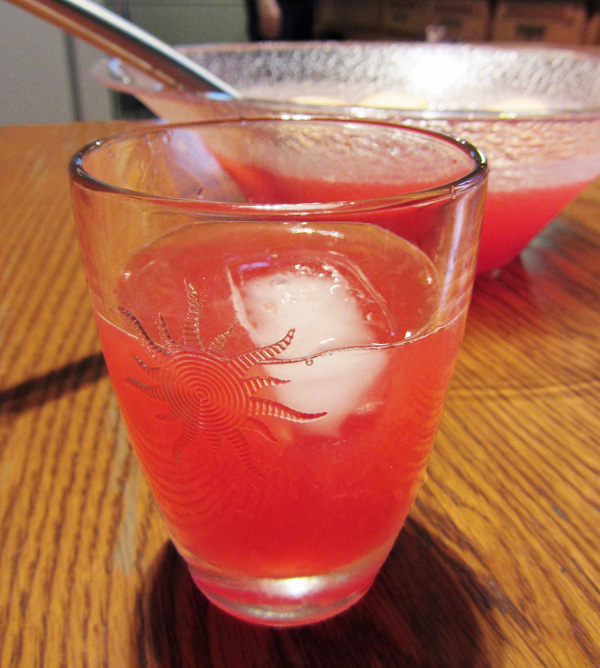 In a large punch bowl, stir together the apple juice, orange juice, and cranberry juice concentrate. Slowly pour in the champagne/sparkling wine/ginger ale. Thinly slice the apple vertically, forming whole apple slices, and remove any seeds. 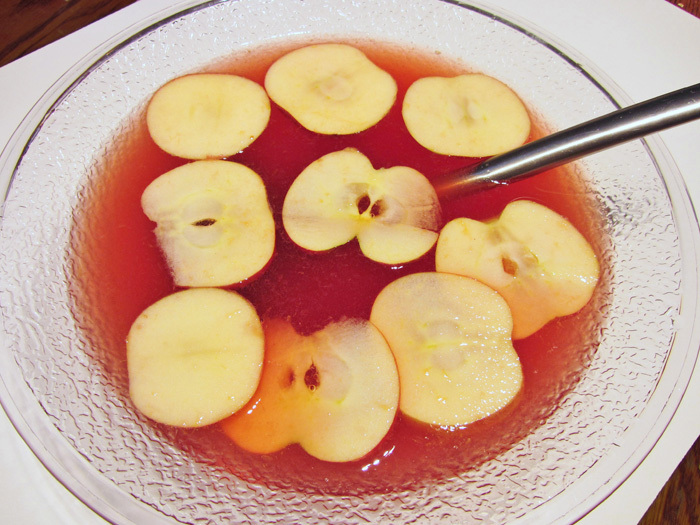 Float the apple slices on top of the punch.